Susan Jacoby, an unsparing chronicler of unreason in American culture, now offers an impassioned, tough-minded critique of the myth that a radically new old age—unmarred by physical or mental deterioration, financial problems, or intimate loneliness—awaits the huge baby boom generation. Combining historical, social, and economic analysis with personal experiences of love and loss, Jacoby turns a caustic eye not only on the modern fiction that old age can be “defied” but also on the sentimental image of a past in which Americans supposedly revered their elders. Never Say Die unmasks the fallacies promoted by twenty-first-century hucksters of longevity—including health gurus claiming that boomers can stay “forever young” if they only live right, self-promoting biomedical businessmen predicting that ninety may soon become the new fifty and that a “cure” for the “disease” of aging is just around the corner, and wishful thinkers asserting that older means wiser. The author offers powerful evidence that America has always been a “youth culture” and that the plight of the neglected old dates from the early years of the republic. Today, as the oldest boomers turn sixty-five, it is imperative for them to distinguish between marketing hype and realistic hope about what lies ahead for the more than 70 million Americans who will be beyond the traditional retirement age by 2030. This wide-ranging reappraisal examines the explosion of Alzheimer’s cases, the uncertain economic future of aging boomers, the predicament of women who make up an overwhelming majority of the oldest—and poorest—old, and the illusion that we can control the way we age and die. Jacoby raises the fundamental question of whether living longer is a good thing unless it means living better. Her book speaks to Americans, whatever their age, who draw courage and hope from facing reality instead of embracing that oldest of delusions, the fountain of youth. Susan Jacoby is the author of nine books, most recently "The Age of American Unreason, Alger Hiss and the Battle for History, "and "Freethinkers: A History of American Secularism." She writes The Spirited Atheist blog for On Faith, a website sponsored by "The Washington Post." She lives in New York City. For more information, visit www.susanjacoby.com. 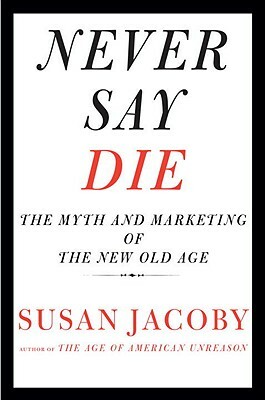 "In Never Say Die, Susan Jacoby confronts the unhappiest of truths: many of us will live too long--both for our own good and for the good of others. This is the darkness that looms over us at the intersection of medical ethics, social justice, economics, and our midnight fears. Never Say Die is a beautifully written, clear-eyed, and deeply compassionate book." "Warning: This book is heretical. Susan Jacoby, one of our most perceptive public intellectuals, examines the current myth that it is possible to transcend the vicissitudes of old age by living right. In this fascinating look at the “new old age,” she shows that it is pretty much like the old one—marked by declining health, loss of independence, and often dementia. It is no service to older Americans to demand that they conform, or pretend to conform, to current notions of a serene, wisdom-packed, if passionless, old age. We need to deal with it as it is, not as we would like it to be."